Waterdog, or some variant in spelling, is a common name for lakes found in the high recesses of the Colorado Rocky Mountains. 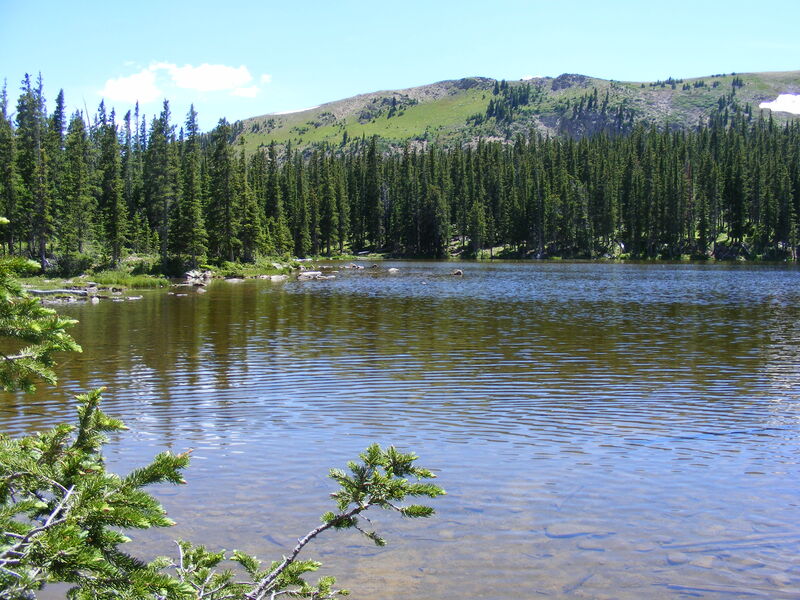 This particular day hike took place at those specific lakes found just under the eastern crest of the Great Divide near Monarch Pass. The trailhead is, in fact, right on U.S. 50. I must have driven by this trailhead dozens of times before I realized that it even existed, such is it set back from the road and out of sight but for a fleeting glimpse as traffic zips past. This was a fine day for exploring the area, as there were high clouds but no real threat of thunderheads. There were still some cornices just off the top of the highest ridges, but otherwise all was green and wonderful, as the high mountains are at the height of summer. The trail up was relatively short, at only two miles or so, but it was a challenge to hike over the rounded rock that makes up the trail base. I remember passing through the dry conifer forest on my upward hike, and a bit of the stream that discharges from the lake. I don’t know the history of the area, but it was obvious that this trail followed an old and now closed road that paralleled a vintage power line. I couldn’t tell it this power line was in service or not, but I did wonder at were it went to and from. The lakes are nice but somewhat crowded. Why wouldn’t you come here? A gorgeous day, easy access, ample fishing opportunities and the Continental Divide looming over all, beckoning those like myself who always want to see what is over the next ridge. I recall that we, Lady Dog and Sheba accompanied me on this trip, indeed climbed up to the ridge deftly dodging those cornices which remained, not any real difficulty, and while the dogs sniffed about and kept the rodents alert, I gazed off into the distance, absorbing just that much more knowledge of the local topography. We didn’t stay long, as I was on the homeward leg of a sad journey for me. I had just attended the memorial for a close friend, and felt that some respite in the mountains would do me a bit of good. I took one last look around at the high peaks and distant ridges, for some reason I took no snapshots of this portion of the hike, and we made our descent. The dogs splashed in the water as opportunity allowed and we slowly made our way back to the trailhead. Due to the pace and volume on U.S. 50, I snapped on the dogs’ leashes before we crossed, as I had done earlier preceding our hike, and we made it safely across the highway. It is snowing out now as I write this, and but for these pictures, I would doubt the existence of summer! The mighty Sawatch Range of central Colorado dominates the western skyline as viewed from the Arkansas Valley. Towards the southern end of that range, where the high peaks tower over the small cities of Buena Vista and Salida, lie what are collectively known as the Collegiate Peaks. They have been named Harvard, Yale, Princeton and Oxford. However, there are more peaks than noteworthy colleges and two of the southern peaks carry Ute names: Shavano and Tabeguache. All are part of a massive bulwark of rock that formed when the mountains rose and the valley slipped along the responsible fault. Yes, the earth is alive, or at least animated even if its movements are too slow for us humans to perceive. From Salida one can look up to Mount Shavano and in most years see what is referred to as the Angle of Shavano. This angle is formed by snow patches that linger into summer and melt out into the peculiar shape of this angle. In my opinion it looks more reminiscent of one of the aliens that emerges from the spacecraft in “Close Encounters of the Third Kind”, sans legs. Regardless, it is a well known sight up on the mountain side during June and July. Near the Angle of Shavano campground, found in North Fork of the South Arkansas River, lies a trailhead for a nearby portion of the Colorado Trail. The elevation is more or less 9,200 feet, and therefore I would be climbing some 5,000 feet to reach the summit. There are other trailheads that offer shorter and easier hikes, but involve more driving. So, avoiding a longer drive, I made off for the summit in the mildness of early morning. The hike begins with a steep ascent up and over a divide before the trail levels off for the next mile and a half. This mile and a half is a great location for montaine elevation wildflowers and the aspen, conifers and interspersed meadows made for pleasing accompaniment as I hiked and admire the scenery. I didn’t take any photos of this area, sadly enough, because on my way up I was in a hurry and on my way back I was possessed with the thought of reaching the trailhead. But I remember my impression on how in awe I was of the lushness of this part of the trail. Especially on my way up, the morning light was low and made for an especially alluring setting as the sun poured through the aspen and lit up the dew-drops which sparkled like so many diamonds. I shortly passed by the more commonly used trailhead for this summit whereupon I was joined by the multitudes, all of us with a common goal of visiting the heavens. At this point, or rather about another quarter mile on, there is a side trail that leaves the main and heads off to the summit. It becomes relentlessly steep from this point on. The rocks and cobbles had been well worn from erosive action and were consequently rounded and at times felt like ball-bearings under my feet. I passed from the spruce, fir and ponderosa and into a bristlecone forest. Every so often, a view would present itself and I could see just how far I had come and how much further I had to go. Eventually, I found myself passing through treeline and emerging into the same gully that produces the Angle of Shavano. Here I was, stomping through the snow pack that I have so often viewed from the valley floor, thousands of feet above and now looking down. It was surreal somehow. There were flowers in abundance at 13,000 feet. I made note, and passed them by. So far, the hike up had been challenging, but I was in a good space and made easy time, each step seeming to paradoxically gain strength. I reached the saddle beneath the peak, where the wildflowers had their display. I made off for the peak, and of course this last thousand feet was the most challenging; there was no real trail to follow and navigation had to be done through boulder fields and other obstacles, and it was really steep at times. I paused repeatedly, my easy feeling having turned to an atavistic determination. Muscles tired and depleted, route uncertain, overall prognosis wavering on the edge of capitulation; but one step at a time, repeated, and the realization that I was making progress even if slowly, that is was kept me moving forward and up. Finally, the lost rock was surmounted and the peak of Mount Shavano was attained. What a sublime feeling I had, perhaps caused by the rarefied air lacking its usual quota of oxygen, as I turned my gaze to the surrounding peaks and the Arkansas Valley below. I, like so many humans in the past, wished for wings so I could let my physical body soar as my spirit was assuredly doing at that moment. Summer in the mountains is defined by experiences such as these. Peak after peak, ridge after ridge peeled off into the distance. This summit made of rock so raw. In some ways closer to the earth’s core, more primeval at least, than the surrounding valleys that are filled with the eroded detritus far removed from these high peaks. I had brought along my two dogs, Sheba and Lady Dog, who were busy investigated reported sightings of marmots and pikas. These larger rodents make quite a bit of noise when threatened and the marmot has earned the appellation of whistle pig for the high pitched alarms which they emit with regularity. While I was in awe of my surroundings for the pups it was just another day out in the woods with all the attendant sights, smells and sounds that must be accounted for. Prime age dogs, and these two liked to travel, they barely seemed phased by the hike up and while I rested, ate my lunch, took pictures and otherwise relieved myself of burdens, they were a continuous blur of motion until finally satiating their senses they, too. loafed on the rock and ate a snack. July in the Rocky Mountains is also monsoon season, and the rains come along nearly everyday along with thunder and lightening. Climbing down over wet rock is slippery and dangerous and can make what is otherwise an easy scramble a difficult challenge that may require ropes instead of steady balance. So, having started early I reached the summit well before the thunderheads were able to be built up for the afternoon revelry. But what would occur over the next few hours was plainly obvious, and besides desiring not to have to slip and stumble over wet rock for a thousand foot descent I did not want to have to dodge lightening strikes that would surely strike the vicinity of the summit. So, I departed my lofty perch and returned to the saddle just above the angle. Here, I wondered off the beaten path a short distance, feeling more secure from the electric javelins that would be shortly falling from the sky, and marveled at the field of alpine daisies that I had noted on the way up. We sat, resting the muscles for a bit, and as time went on I became aware of movement a quarter mile out on top of a nearby ridge. As it turns out, there were six to eight bighorn sheep grazing away contentedly. They don’t seem to get perturbed over weather related events, and remained in place as the first rumblings could be heard emitting from the above clouds. I, on the other hand, made haste for lower elevations, passing down below treeline so as to find perceived shelter. Trees provide a psychological respite from heaven’s electric gift if nothing else. The rains began to descend as well, and I made more haste until well below the high ridges and slopes. Once I reached the main trail, the rain moved off and the remainder of the hike was resumed through the gorgeous meadows and forests made fresh by the recent downpour. I was happy to reach the trailhead, and rest my weary bones. What a day! My body was tired, but my spirit was freshened and my soul renewed. There is no denying that I love to hike, backpack and explore the wild places that have so far escaped sacrifice to the machines. Places where not only humans can find refuge and sanctuary but also all the other living creations, whether animated or not. However, there is a side of me that loves ghost towns, abandoned railroad grades and the like. One of these manifestations of the past expresses itself in finding the old highway. That neglected strip of two-lane concrete sitting forlorn while traffic flows by on the newer, straighter road; the old guardrail neglected and falling to pieces; or perhaps some old signage long forgotten. At one point, from approximately 1939 to 1953, Colorado had a much expanded state highway system. Most of the highways that were added to the state system in 1939 were subsequently turned back to the counties from which they had originally been appropriated. One of these highways is the one from which this sign is the sole remnant. State Highway 305 ran south from what is now the Redwing Road in Huerfano County along what is currently known as Pass Creek Road and then up and over Pass Creek Pass to its terminus at U.S. 160. This highway was never paved and remains a dirt road to this very day. Incidentally, Redwing Road used to be part of signed State Highway 150; it was also turned back to the county in the early 1950’s. 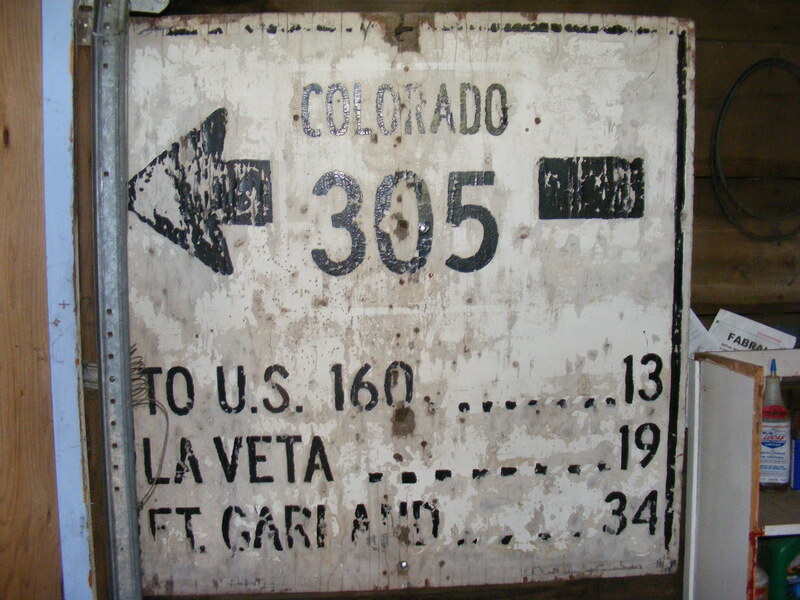 Amazingly, although SH 305 was decommissioned many decades before, this sign was still standing in the field until 1999 when it was finally replaced by standard “TO U.S. 160” signage, complete with the proper shield referring to the federal highway. I had had my eye on this sign because I recognized its historical interest and relative uniqueness, so when it was casually discarded and left by the side of the road, I took it. I doubt that anyone minded, unless they had wanted this relic for themselves. However, I did allow well over a month pass, letting this indisputable piece of highway history rot in the weather, before finally deciding that nobody was going to save it for posterity. This old sign was made from one inch plywood and measures about four by four feet. As if someone took a standard sheet of plywood and cut it half. This sign has always fascinated me. This area and the road it formerly denoted have been a backwaters, so to speak, since the coal industry left the area in the 1950’s and 60’s. The current signage doesn’t have nearly as much information, such as mileages and destinations, as this older sign does. What is interesting is that this sign had been painted over at least once. Upon close inspection, you can see where the road department (I believe they were called the Division of Highways) changed the style of dots used, and that there was a border around the “305” and word “COLORADO”. Anyhow, I am glad to have this sign in my possession. To me and a few others it is a fascinating piece of our historical heritage. Oh, and for those keeping track, what was SH 305 is now the eastern portion of Huerfano County Road 570 between CR 550 and 572, all of CR 572 and all of Costilla County Road 29. Notice the older dots previously painted over? Upon close inspection, the old border around “COLORADO 305” is visible. The night passes uneventfully and the clouds slowly dissipate, by morning the sky is blue and clear. I stroll down to Texas Creek and take another gander at the torrent of water racing by. The sun is pouring down the valley at a low angle, and the light is pleasing as only morning light can be. The peaks glow with rosy and yellow accents, and all the vegetation, covered in a thick morning dew, shines iridescently when struck by the incipient light. The sun’s warmth is soothing and but for the roar of the passing creek all is silence. I return to camp and stow my gear and before long we are all hiking back the way we came, up to Cottonwood Pass by way of South Texas Creek. Yesterday, I had decided not to try to ford Texas Creek, which decision consequently shortened my hike. The first stage was to climb up to the bench that lies above South Texas Creek. Along the way, the squirrels chattered at us as we passed and the dogs were not able to contain themselves and tore off attempting to locate the source of high-pitched cackling. They were successful at that, but not in their attempt to scale the trees within which the noisome rodents went about their business. Towards the summit of the trail, Lady Dog, always the most visually stimulated dog, chased some rocks, that she had kicked over the edge of the trail, down a steep slope some few hundred feet and in the process managed to disengage herself from the panniers she was carrying. Of course, she didn’t bring them back up, and sure seemed proud of herself for “getting” the rocks, so I had to remove my own pack and scamper down over the scree to retrieve her gear. Otherwise, a good hike up, all green and vibrant. Near the confluence of South Texas Creek and Texas Creek, looking downstream on the latter. Cottonwood Pass is one of numerous passes on the Continental Divide in Colorado. 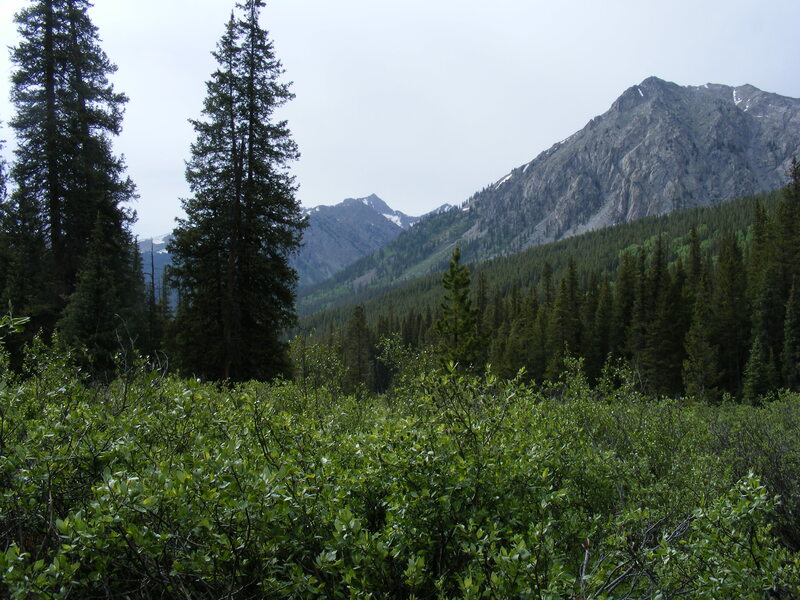 Located more specifically in the Sawatch Range, it leads from Buena Vista to Taylor Park, or the other way around. At the top of the pass are grand views of the surrounding mountains; a person can start here and walk a hundred feet or a hundred miles and either way mountain spirits are invoked. It is easy to go east down the North Fork of Middle Cottonwood Creek or west down Pass Creek from the top of Cottonwood Pass. For my one-night backpacking trip, I chose to go east almost a quarter mile before slipping north over another unnamed pass leading into South Texas Creek and back in to the Pacific drainage. None of this requires extraordinary skills as a navigator, but rather the simple ability to follow the South Texas Creek Trail, the trailhead of which starts adjacent to the parking lot at Cottonwood Pass. The parking lot is almost always crowded during July, and for good reason. 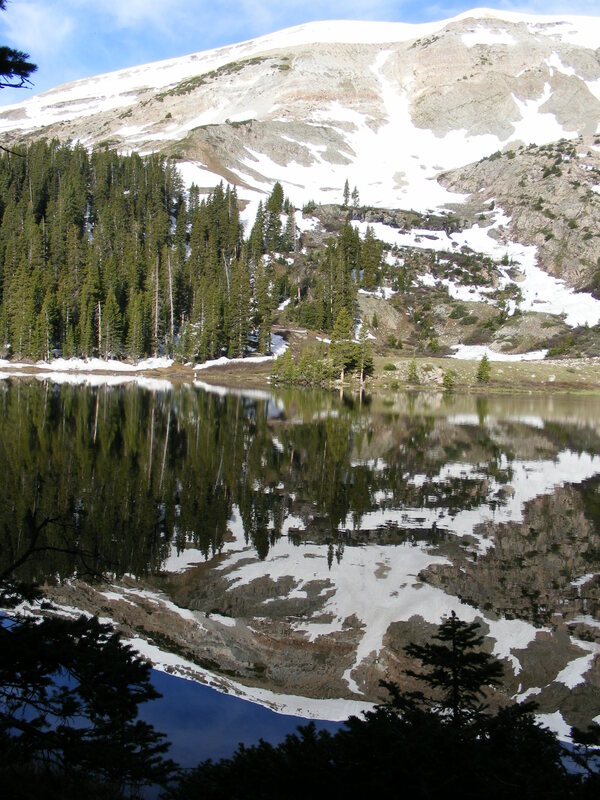 Cottonwood Pass is surrounded by conical peaks and long ridges, many still topped with snow or streaked with cornices. Almost immediately upon crossing into South Texas Creek the crowds are left behind, and as I descended the first steep slopes into the upper bench above the main drainage I was encompassed by thick willows and blueberry shrubs. Without the cut and maintained trail, it would have been difficult to pass through here, such was the density of the vegetation. It would be another two weeks or so before the mountain flowers would be at their height, but even at this relatively early segment of the season there was plenty of color to behold. The trek down along the trail was soggy due to the standing water and numerous creek crossing. Most of the snow had already melted out, but with the summer temperatures catching up to the elevation the final, grand melt was far along. There must have been mosquitoes and flies in abundance but time has dulled their sting. After a couple of miles of hiking, I reached the end of the bench where South Texas Creek poured into the main stream. My view widened so that I could now see fully east and west along Texas Creek. The Sawatch Range bedazzled me with lofty peaks, spires, fins of rock; my navigation was befuddled until I realized that the distant 13,000 foot ridge wasn’t necessarily the home to the highest points. Alas, I have to admit some disappointment on this hike. I had intended to hike down to Texas Creek and then cross and hike up that drainage for another two or three miles. Upon reaching the crossing I found that the waters were high enough to cause pause and then abandonment of those plans. There was a group of people attempting the crossing, and I believe I could have done the same, but I wasn’t for the dogs trying; it would have been too easy to be swept down to our demise. The torrent was amazing to behold, as I had previously visited and crossed this creek with ease; but that was during autumn, when the waters are low. Part of mountain craft is knowing when waters can or can’t be crossed safely. I had anticipated high water and a challenging crossing, but this was more than I wanted to try. So, in the end, I chose a campsite in the thick forest nearby, and enjoyed an evening of peace in the forest. In my opinion, a night in the woods is seldom wasted, unless under duress, and I slept well. The day before my 38th birthday I treated myself to a jaunt up to Mount Belford, one of the state’s more than fifty summits above 14,000 feet. 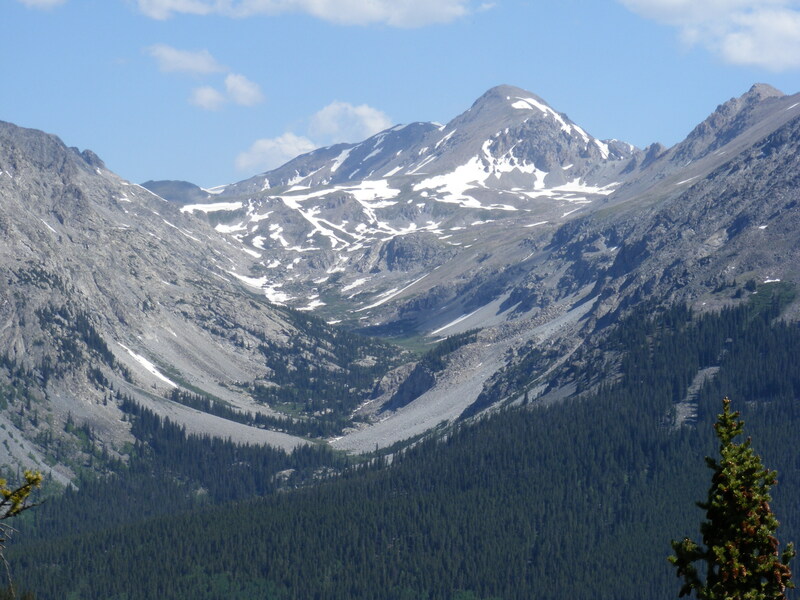 Mount Belford is located near the heart of the Sawatch Range, the high, central divide that also parts the waters between the two oceans. It was a spectacular day, to say the least. There were big, white clouds in the sky, but they never formed thunderheads. The winds were never more than a breeze, pleasant and cooling. 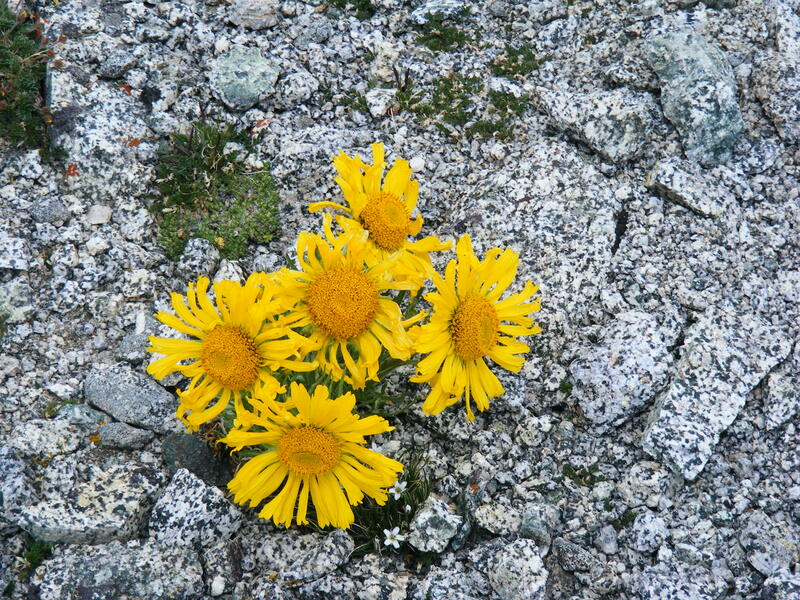 The flowers were blooming at all elevations, including near the summit. There is more than one access point for this peak but I used the most common one located on Clear Creek. To be sure, that is the Clear Creek that drains into the Arkansas River. How many Clear Creeks are there in Colorado? Too many to keep straight, I would guess. There is a trailhead located near Vicksburg. There is no grace period on this trail, as immediately the dogs and I were climbing a series of switchbacks that carried us up the first 500 feet. Shortly, there is one challenging creek crossing to be navigated. For the most part the trail is continuously climbing and climbing, through mostly conifer forest until finally an opening in the forest canopy allows the first full view of the summit. Shortly afterwards treeline is passed and the climbing begins in earnest. There was some well-packed and solid snow remaining for about a quarter to half a mile of the trail where it was near the bottom of the gully, but otherwise the trail was snow free and made for easy hiking. Once I viewed the summit of Mount Belford, it was obvious what route I would be taking. There is a large shoulder that drops to the northeast off of the summit and the impressive series of switchbacks that climbed ever upwards was evident even from distance. This trail is well maintained, and the hiking was easy and steady, but a climb it was. The switchbacks seemed to continue on relentlessly, yet when I could compel my tired head to rise to take in the surrounding view, each new pivot revealed extended perspective and renewed appreciation for the mountains and their mightiness. There were many people on the trail, which is to be expected since the 14’ers are well known to be the acme of the peak bagging experience in Colorado. For that reason, I was later happy to have the summit to myself for a quarter of an hour and change. I was fairly tired when the summit was ascended at last. The dogs and I had just climbed over 4,000 feet and while the pups entertained themselves with the small mammals in the area, I rested and took in the amazing view. Peak after peak, a seemingly never-ending chain of mountains stretched away to the north. There was a considerable amount of snow remaining, and I was amazed that I somehow had found a passage through it all to reach this summit. I felt like I was on top of the world, which in a manner I suppose I was. The rarefied air, the view out and over the world, the ability to see down thousands and thousands of feet into the rushing streams… I was almighty, and, yes, its a cliche, above it all. And the flowers! So small, so delicate, clinging to life in this inhospitable corner of the world; small is each individual flower, but in aggregate their presence lent color and fragrance, and what a smell. It was reminiscent of a candy store, such was the sweetness of the perfumed atmosphere. So small those flowers, but glowing. Here, at 14,000 feet, was a garden perhaps only mildly interesting to those with tastes that prefer larger blooms but those whose preference is to catch a whiff of wildflower’s bouquet then that individual would be in both literal and figurative heaven. I hated to leave, such was the surrounding beauty. The view held me in its sway, but I finally pulled away and made my way down a longer but less steep route that took me down to Elkhead Pass. From there, I trod to the north and was once again in the same drainage, Missouri Gulch, from where I had started. But this upper basin was in itself a gorgeous location that invited a stoppage to investigate its primal character. The fields of flowers, large patches of snow, and gurgling streams all delighted the senses. The dogs couldn’t help but run onto the snow patches and wade through the creeks. Splendid high peaks capped with cornices of snow made for an inviting halt in the descending trek, and the splendor was admired. Eventually, the trailhead was reached, and although tired, I was thrilled to have spent such a day, surrounded as I was by intense beauty. The dogs loaded up, and we made a short visit to the ghost town of Vicksburg. It never had been much, and just a few summer cabins and the small graveyard were all that remained. A somber reflection to end the day; we are not permanent but the mountains, relative to our lives, are. How can mere rock and stone have so much soul? There is so much beauty to be had, if people would just take some time to feel. The early morning chill dissipated as I climbed the ridge to Fossil Mountain. It was steep although the overall ascent wasn’t more than a few hundred feet. Most of the clouds from the previous day had continued east on their journey across the continent, and the air was completely still; the affect on the lake was stunning – a perfect mirror surface reflected the towering cliffs, most of which were still clad in snow, on the water. The air is thin at this high elevation, midway between 11,000 and 12,000 feet, thin but crisp and imbued with the scent of spruce. Despite the lack of oxygen, I felt invigorated and the attainment of the ridge allowed a fine view of the surrounding mountains. After a short bushwhack avoiding the steepest slopes, the dogs and I found ourselves atop the ridge were fields of wildflowers, naturally diminutive due to elevation and exposure, occasionally stimulated my olfactory senses as the scent wafted through the air on the sporadic breeze. The dogs, Lady Dog and Sheba, frolicked to their hearts’ content. 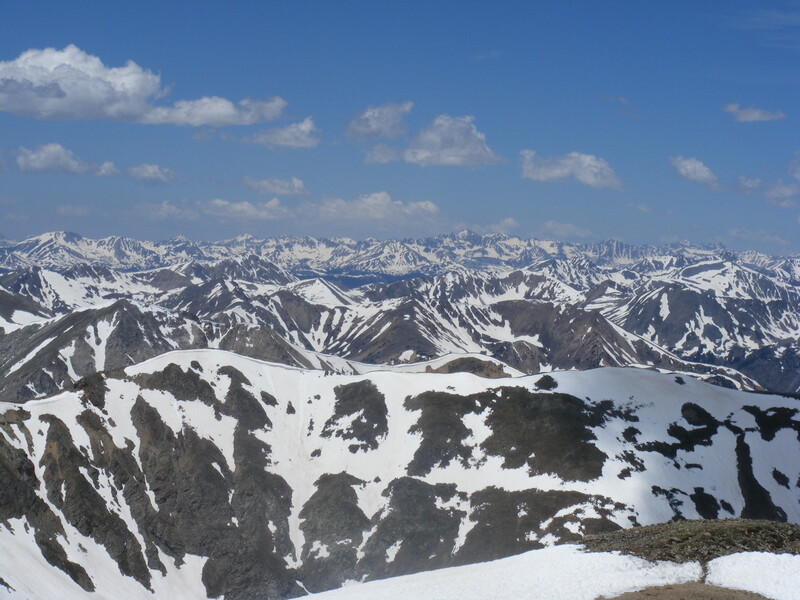 From my perch atop this ridge, I could look down into neighboring Lamphier Lake, gaze the distant Sawatch Range and otherwise unlock some of the topographic mysteries that I had been puzzling to solve. We were surprised by a small band of Bighorn Sheep, who were grazing contentedly and didn’t seem to upset by our presence. To be sure, we kept our distance, and although I had wanted to summit Fossil Mountain, a short distance away, I decided that discretion was the better part of valor in this instance and, not wanting to disturb the sheep and cause them unnecessary movement, returned to the lake. Once descended from the ridge, the dogs continued to frolic and explore while I dismantled camp. We packed up, and began the short, two-mile hike to the trailhead. Along the way I took a short series of snapshots of a somewhat uncommon Calypso orchid, often called fairy slipper. The appellation is appropriate as the main part of the flower looks as if it could be immediately used with minimal modification as a slipper for a small fairly. This small, pink orchid is always a pleasant surprise when found in the forest and will invite appreciation from all but the most cynical of people. A fine way to finish up this hike, enjoying the bright colors of the summer vegetation. Mill Lake is one of my favorite places to visit, and this hike, like many others, did not disappoint.